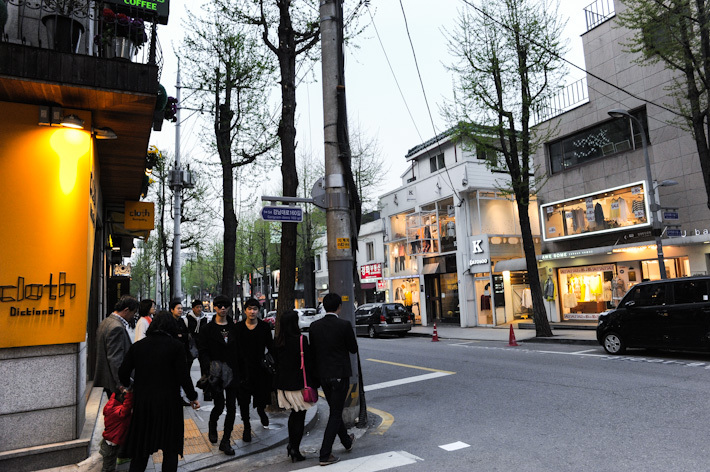 Located between Sinsa-dong and Apgujeong, Garosu-gil – which means “tree-lined street” in Korean – is fast becoming the hippest area in Seoul. An intriguing combination of the old and new, this quarter exudes an inexplicable charm that warrants a visit, and definitely one of the things that you must do when you are in Seoul. Here are 5 things that we love about Garosu-gil in Seoul. I often wonder how long it’d take to visit all the cafes in Seoul. Acknowledged by the locals themselves, Seoul is a café paradise with lovely coffee houses sprouted all over the city – you wouldn’t need to travel far to find a decent one. Other than Korean chain cafes such as coffeesmith and Homestead Coffee, Garosu-gil is populated with lots of bakeries and bistros that will have you spoilt for choice. 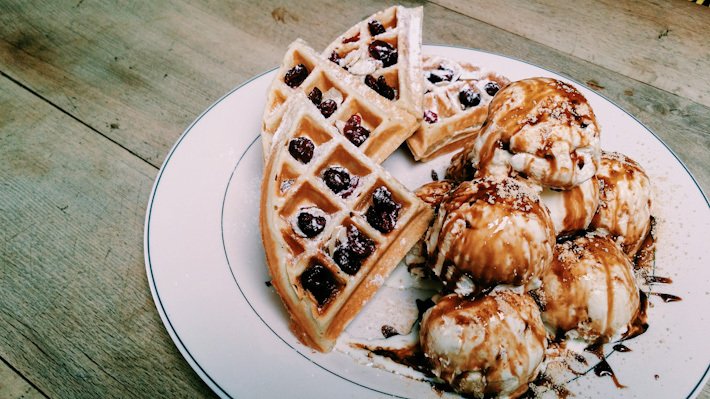 From fusion restaurant School Food to enchanting cafes like Café Oui (which serves adorable 3D coffee art and whose portions are extremely generous), these places are not only aesthetically pleasing, but they also make your tummies very happy. 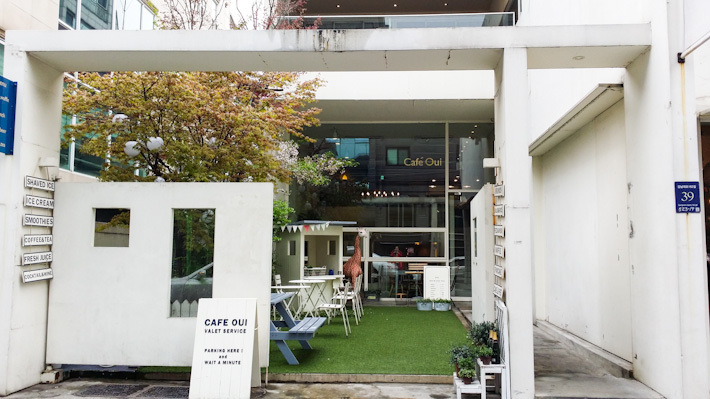 Read our guide to the 10 cafes that you must check out in Seoul. 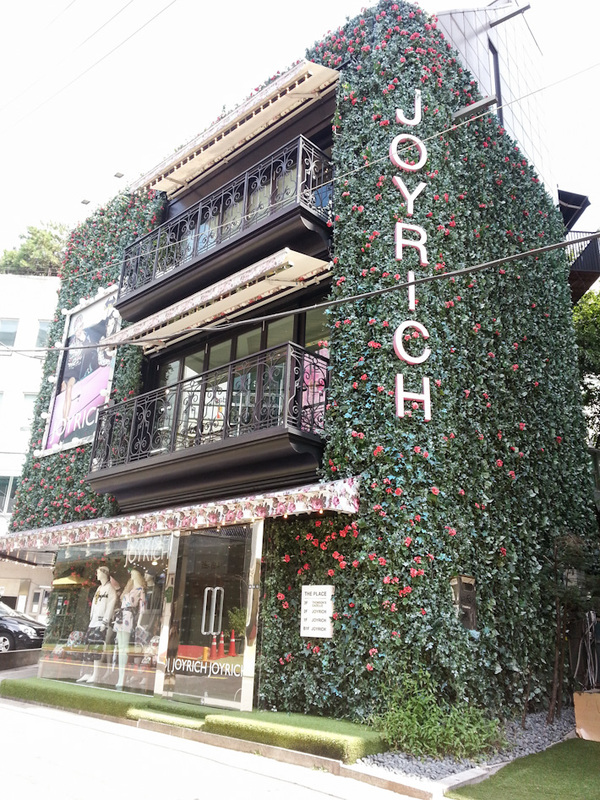 It is hardly an understatement to say that Seoul is a shopping haven. There’s inexpensive and made-in-Korea shopping at the underground malls in Gangnam, and then there are deals to grab all night long at Dongdaemun. So what makes shopping at Garosu-gil special? 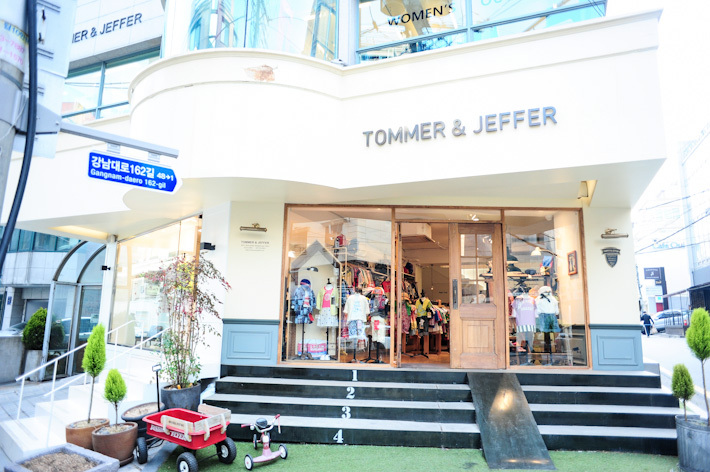 Known as a fashion promenade, you get your fix of international brands such as Forever 21, Massimo Dutti and Zara, as well as Korea’s very own home-grown labels including Åland and 8ight seconds. Besides chain stores, Garosu-gil is a breeding ground for aspiring and independent designers. If one-of-a-kind is your cup of tea, give this street a shot. The thing which really stands out at Garosu-gil is, in fact, the curiously decorated shop fronts that spell “effort” and which easily become photo spots for trigger-happy visitors. Lest you say we didn’t warn you, the boutiques here look so pretty that they make you want to check out the store, even when you have nothing to buy. You know a place’s great for people-watching, when even the shop assistants are stylishly dressed and well-groomed. A frequent hang-out for local fashionistas and buyers, Garosu-gil embodies an interesting mix of haute couture and commercialism. While it is not as upmarket as Cheongdamdong and Apgujeong, it is not overly mainstream and thus retains its “arty-farty” vibe. Spend a few hours here and be impressed by the passers-by who look as if they just walked out of a fashion shoot. As we have noticed Garosu-gil getting featured on TV programs, this trendy area has become a hot spot for filming, partly due to its close proximity to various entertainment agencies. 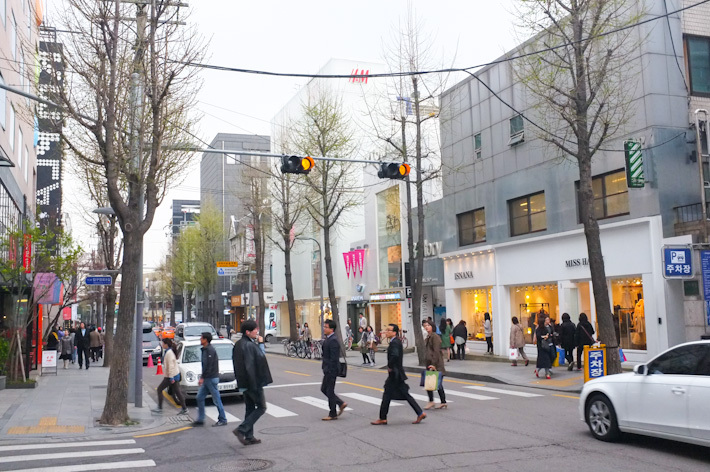 To name examples, popular idol group EXO visited this street more than once when they were filming variety-reality show EXO Showtime, while BEAST was recently spotted in this area to shoot their new program BEAST’s Show Time. We don’t encourage celebrity-stalking, but do keep your eyes peeled while hanging out in Garosu-gil. Who knows, you might just get lucky. In recent years, the human traffic in Myeongdong and Hongdae have increased multifold, thanks to brilliant marketing by the tourism board and the Hallyu wave. Although these areas are still definitely a must-go, most of us do crave for some tranquility during our vacation. As compared to the bustling streets of tourist hotspots, Garosu-gil offers a good alternative to meet all our needs – eating, shopping and relaxing. Night owls may find Myeongdong boring after 10pm and non-party animals may find Hongdae and Gangnam a little rowdy after midnight; this gives you more reason to check out Garosu-gil, before it gets too crowded. GETTING TO GAROSU-GIL: Sinsa Station (Line 3), Exit 8. Walk straight for three blocks (approximately 250m) and turn left onto Garosu-gil. Dang Hui Ling is a bilingual (English and Chinese) Entertainment and Lifestyle writer at Singapore online portal xinmsn. With a thirst for good food and travels, she shares her gastronomical adventures and shoulder-rubbing encounters with celebs on Instagram. I will be visiting Korea in Aug. for the first time..
And I am soo excited.. I just want to know where will I find Korean designers shops? Though I am not the author of this article or related to ladyironchef, but since I’ve been to Korea before, you can try garosugil, they’ll have clothes sold that are designed by korean designers, or you can go to this store, ALAND, thats almost every hotspots in Seoul. ALAND is a chic male and female clothing store, that sells korean designer brands or some cool brands like Cheap Monday or Rivieras. The price can either be cheap (or affordable) or expensive. You can go Myeongdong, there’s some clothing stores, but more makeup stores though. You SHOULD GO HONGDAE. The clothes there are so hipster-ish and trendy, and mostly by Korean designers. Hongdae is really suitable for the young. Hi there! i’m visiting SoKor for the first time this Spring and being a korean drama addict that i am, i’d like to know if you know some cafes where some kdramas were filmed? your inputs would be much appreciated.